As the hardest working space, kitchen occupies the central area of every house. It is the heart of many homes, the place where cooking happens but also where families gather to spend some time, friends socialize over a cup of coffee and sometimes children do their homework. Hence why, this all-purpose space needs to be in a perfect condition, designed to appeal to many people and still stay practical in its layout and design. This perfectly planned layout has to be determined by a professional, as it is so easy for a layman to get lost in the myriad of choices and options that kitchen remodeling provides. 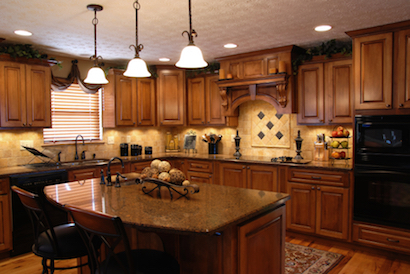 A professional kitchen remodeling company will help you decide what the best place for appliances, cabinetry and islands is, whether the walls should be opened or not, the type of doors and cabinetry that will be best suited for your home as well as where any additional storage compartments should be placed. When it comes to countertops, they will ensure that the ones you end up installing in your kitchen perfectly reflect your particular cooking and entertaining style. From quartz and marble to stainless steel, granite and wood, the options for countertops seem endless. Knowing that each of them comes in patterns, solid or stain will only make the decision that much harder. Furthermore, the chosen countertop should also go perfectly with the style and color of the floor, wall coverings and backsplash. Next to the countertops, a home owner will need help deciding on the right faucet and sink as well as the light fixtures and one of the biggest items in the kitchen, flooring. In addition to being pleasing on the eye, floors also need to be practical, able to sustain any spills that might occur as well as a lot of wear and tear. This is precisely the reason why so many people opt for a stone or granite flooring, which are quite durable, but expensive as well. For those on a tight budget, it is recommended to choose one of many engineered hardwood floors, or to opt for linoleum, vinyl or ceramic tiles. This is just a tip of the kitchen remodel iceberg. Many more decisions lay ahead. But with the expert help from your Hollywood Refinishing, the decision process will be enjoyable whereas the final kitchen remodeling project completed exactly to what you have envisioned. 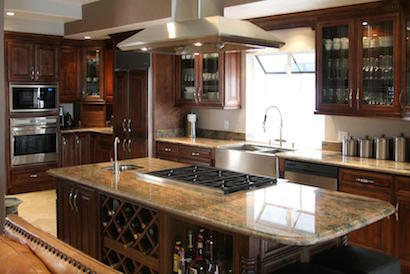 With over two decades of experience in the area of kitchen remodeling, we pride ourselves on always exceeding clients’ expectations, investing all our knowledge, expertise and skills in providing a high level of service in a short period of time. As all our products are manufactured in the USA, you can rest assured that your kitchen items are of the highest quality and exactly what you have ordered. All materials used in our projects and through our process do comply with California’s law and we take all measures to keep it safe for the environment, so that your kitchen promotes renewable, clean energy, saving you money and resources while at the same time having a positive impact on your health as well as the health of all the family members.